Principal teacher, choreographer and founder of Phoenix Belly Dance. In addition to this, Candice’s biggest passion is working with the dancers in her classes and troupes to develop and challenge them to reach their potential. Candice aims to show her students that belly dance has benefits for everyone, both psychological and physical. Many of her students have found belly dancing to be a catalyst for their personal growth, and becoming part of a caring community. The multiple layers and genres of belly dancing that Candice teaches, allows students to explore and find the styles they are most comfortable with, ones which make them feel beautiful and powerful. Some of the highlights of her career have been presenting performances and workshops internationally in Turkey, Fiji, Australia, South Africa, and soon to be - Spain, as well as featuring in Jillina’s Belly Dance Evolution and BellyQueen’s Silk Road Show! She has also led her troupe to win prestigious titles such as the Jambalaya multi-discipline dance competition, the Viva Eclektika Asia Vision Cup, and the Corporate Event Guide’s Best Entertainment Company Award. Some of her high profile clients have been Coca-Cola, Sky City, Fairfax Media, Tamati Coffey, Atif Aslam, Phil Goff, and Julian Savea. Candice is not only a performer and teacher, but also an event producer. Some of her undertakings include: international belly dance tours to the Middle East and North Africa, annual retreats with international guest teachers that are about reminding dancers of the social and fun aspects of the dance, festivals and workshops with local, national and international stars, and theatre shows. She uses many of these opportunities to fundraise for her local women’s shelter, the North Shore Women’s Centre, for whom she is a devoted supporter and campaigner. More than all of these wonderful experiences, it is Candice’s expertise is as a Business Analyst which has given her a wonderful foundation for managing the every day workings of one of the largest Belly Dance Companies in New Zealand. Her greatest responsibility and dream is to uplift and educate the community, share this art form with the public, and produce both modern concepts and preserve the integrity of the cultural roots of the dance. Professional belly dancer and master teacher from Brazil, Vanessa Castro has around 13 years of experience in belly dance. She's the director of her school, 'Studio Vanessa Castro', in Curitiba Brazil. In 2014, Vanessa took her training to the next level, travelling around the Emirates, Lebanon and Egypt to learn more about culture and dance. Her passion for her art form is matched only by her love of teaching it. Vanessa has something to offer for dancers of all levels- solid foundations and movements for beginners, and advanced technique for the more experienced. Her expert veil work and flowing movements make her a valuable addition to the Phoenix teaching team. Elea hails from France, and has been a dancer most of her life starting with ballet, that she practiced for 4 years, and eventually falling in love with belly dance. She has developed her belly dance skills from a variety of belly dance studios and has attended many workshops from well known belly dance instructors from all over the world, such as Jillina, Aziza of Cairo, Kami Liddle, Diva darina... She is continuously trying to improve her dance style and technique by trying new styles or taking workshops with different teachers. Elea has performed professionally for many years as a soloist, and joined the Phoenix troupe in 2017. She is always excited to see students shine and learn and does everything she can to help them on their way. Danielle is a tribal fusion belly dance instructor with 10 years of tribal fusion belly dance instruction experience. Danielle is also a professional belly dance performer who has been cast in professional music videos and has experience at halls, clubs, and restaurants, and with live bands. Danielle has been part of Jill Parker's dance companies Foxglove Sweethearts and Little Egypt and Ariellah's company Deshret in California and Audra Simmons' company Lavish in Toronto. Danielle earned a college dance certificate in African Heritage Performance from San Francisco City College and holds a registration in dance-movement therapy. Cindy has danced for as long as she can remember. Though belly dancing is where her passion truly lies, she has trained in contemporary, Indonesian Jaipong and ballroom and Latin dancing. 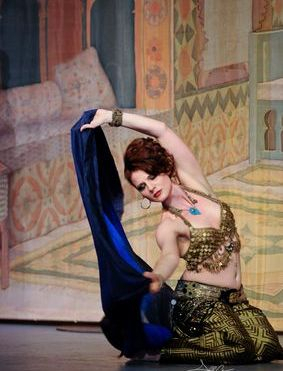 Tutored by international dancers Sandra Bogart and Kim Grison, she made her way into the professional belly dancing world by becoming the resident belly dancer at Nomad Cafe - a popular Middle Eastern restaurant in her hometown - and spent her time there honing her skills and knowledge of the art form. Cindy has trained with many high level dancers, including Jillina, Kaeshi Chai, Irina Akulenko, Elisheva, Aziza, Karim Nagi and Ava Fleming. She has performed with Phoenix at Coca-Cola Christmas in the Park, as part of the opening act for Bellydance Evolution in Oz. She was also cast in a supporting role in the Bellyqueen Journey Along the Silk Road in Australia 2016 tour. Cindy is proficient in many props – including veil, cane, Isis and silk wings – and has experience in a range of performance types. She is a dedicated, patient, and caring teacher who loves watching her students’ skills improve and their confidence grow. Her emphasis is on strong basic technique, modern choreographies, performance skills and of course, fun! Cindy’s infectious love of dance and thoughtful teaching style give students of any ability, age or background the skills to improve and excel. Suei has performed professionally for many years as a soloist, duo and within a troupe. The belly dance training she has developed after many years along with her background in traditional dance has shaped her into the versatile belly dance performer she is today. As a teacher, she strives to convey the technique and culture of the dance form, whilst providing a safe, educational atmosphere.